It’s October and time to put out the pumpkins. Every year the kids and I adorn the house inside with various fall/Halloween decorations, and my husband takes care of the outside placing fall flower pots around our yard and porches. But the kids really get excited about picking and carving pumpkins. This year to make it even more special, my husband grew some beautiful ones in our garden and it was so much fun to watch their progress. Usually the five of us gather around the table about a week before Halloween and we all carve pumpkins together. But this year we just could not wait to begin, and I wanted to do something different in addition to traditional carving. I am not an artist by any means, but I do love the look of a sculpted pumpkin. So the other day, as a dry run before the kids got home from school, I took one of our home-grown pumpkins and went to work free-form sculpting. I had no sculpting tools, just the pointed end of a melon-ball kitchen tool. You can see by the picture that I had no particular pattern in mind. I simply set about sculpting as if I was doodling on a piece of paper. The pumpkin in the picture took me about an hour, and I have to say, it was very relaxing. It ended up looking like filigree and I was pretty pleased with the end result. Once I realized how easy and fun it was, I went to the store and bought the pumpkin sculpting tools…a set for each of the kids (they are available everywhere right now. I bought mine at CVS). You can buy or print out stencils on line, or you can simply draw the outline of a picture/image you would like to sculpt. Or, like me, you can free-form and let your creativity guide you. The pumpkin with the witch’s head was drawn by me free-hand so that the kids could sculpt the outline and then, since the sculpting can be tricky for younger kids, my little one outlined the features with black paint and a paint brush. It is something fun for the whole family. Choose the best side of the pumpkin to work on, but for more intricate patterns, the flatter side of the pumpkin will work best. Use a pair of latex gloves when you sculpt, as the oils in the pumpkin flesh can severely dry out the skin on your fingertips. If you are planning on lighting a sculpted pumpkin, carve a whole on the bottom and gut the pumpkin from the bottom. Your stem will remain intact and you can sit the pumpkin over a candle. However, if you are using a traditional candle and not a battery operated candle, you must cut a hole in the back of the pumpkin for ventilation. To preserve the life of your carved or sculpted pumpkin, rub the inside with petroleum jelly. It will keep the pumpkin from drying out. 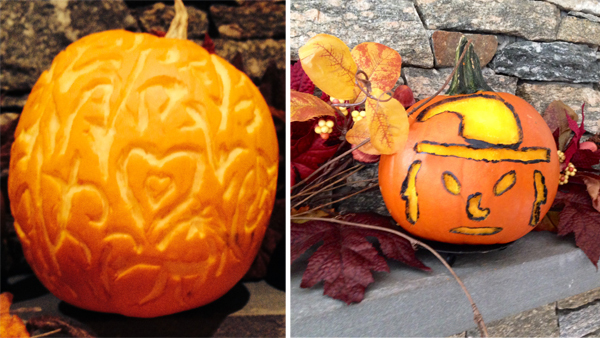 If you are going to sketch a design on the pumpkin to guide you, a grease pencil works best. Roasting the pumpkin seeds? Try adding garlic salt and paprika, then toss and roast. Delicious!